One of my better pictures. 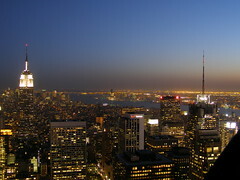 Downtown Manhattan as seen from the Rockefeller Center (Top of the Rock). The empire state building is in the foreground. On the right, along the Hudson bay, Ellis Island and Statue of Liberty can be made out.